Above: The Expo 2015 map. Click here for a larger version. Franciacorta has been named as the official wine of this year’s World’s Fair, Expo 2015, to be held in Milan from May 1-October 31, 2015. 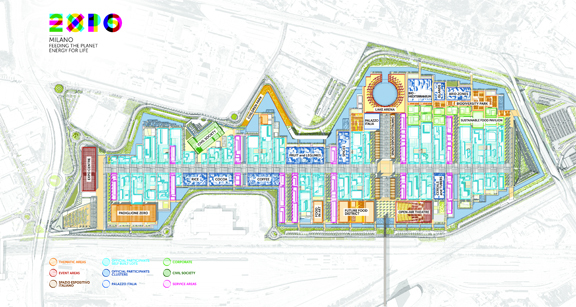 The Expo 2015 site covers 272 acres and will welcome an expected 29 million visitors. Milan is hosting the gathering for the second time in the event’s history (the last time was in 1906). This year’s theme is “Feeding the Planet, Energy for Life” and the fair will include a number of events that feature Franciacorta and its wines. The consortium’s first Expo-related event will be “Il Cibo nell’Arte” (“Food and the Arts”), a show curated by Davide Dotti that will run from January 24-June 14 at the Palazzo Martinengo in Brescia. The consortium is one of the exhibition’s official underwriters.